In pursuit of that mission, The Society has researched and created many historic tours, strolls, and walks that take participants through our rich Delaware County History. We offer those tours to the community as public programs and to school groups as part of our Curriculum Support work. Our most popular history walks have been documented so that visitors can take the tour on their own anytime they wish. 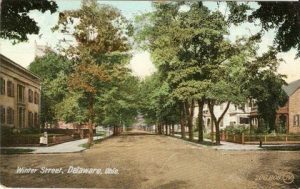 The tours focus on two of the main streets in Downtown Delaware, each filled with historic notes about the buildings you see on these streets today. The Self-Guided tours are available as a downloadable PDF file or a link to a Google Map with the route and tour notes included. Winter Street is a pleasant blend of 19th and 20th century buildings on tree lined streets. On this history walk you will see the 100 year old, and still operating, Strand Theater. You will proceed to see many beautifully preserved residences as you walk toward the Monnett campus and garden. Sandusky Street is the center of the business district of Delaware Ohio. It’s history dates back to the earliest years of the city when it was called “Main Street”. 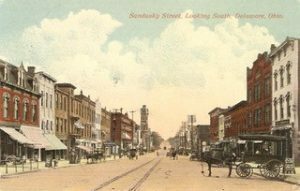 The Sandusky Street Historic District was placed on the National Register of Historic Places in 1982. 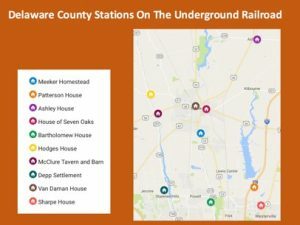 The Underground Rail Road was a secret network of citizens willing to help escaped slaves to freedom. The citizens were the Conductors who guided the escaping slaves between Stations (homes, barns, other buildings) on their way to Canada. The self-guided tour shows you the known Stations in Delaware County with notes about the Conductor families. 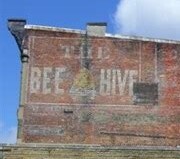 All over America in the late 1800s and early 1900s businesses painted bold, colorful advertising on downtown buildings. These hand-painted signs advertised local businesses and national products. As the paint has faded in the years since, these ads have become known as “ghost signs”. This self-guided tour shows you the Ghost Signs still visible on Downtown Delaware buildings with notes and images about the products and companies. For the second year in a row, history came alive in the Oak Grove Cemetery as costumed interpreters portrayed prominent Delaware citizens at their tombstones throughout the cemetery. This self-guided tour has a map of the cemetery with numbered stops indicating the location of the graves, and biographical information about the individuals, their families, and their significance in Delaware history. After your history walk, stop in at the Cryder Historical Center. Tell us about your walk, Ask us questions, learn more about Delaware County Ohio History, learn about the Historical Society.